Vivo India is rolling out one after the other for its customers in the smartphone market. The company now launches Vivo V9 Pro smartphone with 6 GB RAM in India. The new Vivo V9 Pro smartphone has Snapdragon 660 processor, Display Notch, and Dual Camera setup. Vivo V9 Pro has a fingerprint sensor on the back of the phone. Like the Vivo V9, this smartphone will also be available exclusively on Amazon India. Remember ViVO V9 was launched in March this year. After this Vivo V9 Youth was dropped a month later. If seen, the Vivo V9 Pro Snapdragon 660 processor and 6 GB RAM seems to be a big upgrade. 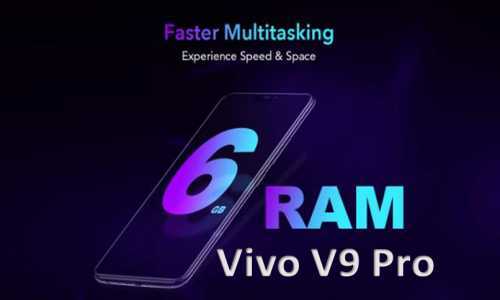 It also appears that the company has introduced Vivo V9 6 GB Ram variants launched in Indonesia in the name of VivoV9 Pro. The VivoV9 Pro will be sold for 17,990 rupees. VivoV9 Pro will be made available in black color. It will be available on Amazon India in the market. In the market, this phone will be confronted with Xiaomi Mi A2 and Nokia 7 Plus, which comes with the Snapdragon 660 processor. The Dual SIM Vivo V9 Pro Out of Box will run on the Android 4.0 Orio based FanTouch OS 4.0. It has a 6.3 inch (1080x2280 pixels) full-view display 2.0. It is equipped with Snapdragon 660 processor AIE processor. Adreno 512 GPU is integrated for graphics. 6 GB RAM has been provided for Jugalbandi. Screen to body ratio is 90 percent in the display panel. Inbuilt storage of this is 64 GB and if needed, up to 256 GB MicroSD card can be used. The VivoV9 Pro has a dual camera setup on the back. One sensor is 13 megapixels and the other is 2 megapixels. VivoV9 Pro has a front panel 16-megapixel camera with F / 2.0 aperture. It also has AI Selfie Lighting and AI Face Beauty Feature. Vivo V9 Pro features 4G VoLTE, dual-band Wi-Fi, Bluetooth 4.2, GPS / A-GPS, 3.5mm headphone jack, USB OTG, and Micro-USB port connectivity features. Vivo V9 Pro's battery is 3260 mAh. The dimensions of the phone are 154.81x75.03x7.89 millimeters and weighing 150 grams.